Examine more on bag filtration and filter media because they affect how we live our daily lives! In part one, we examined bag filtration and the various types of filtration products we carry. 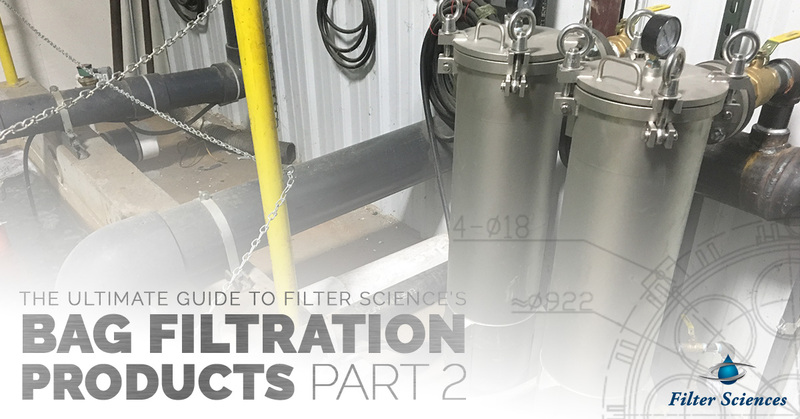 In today’s post, we’ll continue the conversation to help you get a clear picture of the different components that make our bag filtration systems stand out and lead the industry! At Filter Sciences, we excel in bag filtration systems, and with that encompasses the many parts and pieces that aid in its high quality and premier filtering capabilities. Follow along in part two and gain a better awareness of the parts and pieces incorporated in the bag filter housings we carry! Deciding on what kind of bag filtration mechanism your business needs can be complicated, so you can always reach out to us with any questions — we’re happy to look over your operations and help guide you towards a bag filtration system optimal for your industry. The largest difference between choosing a single bag and multi-bag filter housing is the flow requirements your industry has. If you’re dealing with lower flow requirements (up to 250 GPM), single bag filter housings are ideal. They are more cost-effective with a clean design that makes changing bags effortless. If your industry has a higher flow requirement, a multi-bag filtration system may better suit your industry. Not only can a multi-bag filter housing support higher flow rates and reduce downtime for bag changes, but our design is also unobtrusive with a positive seal that prevents leakage and bypassing. Bag housing flow rates – Flow rates are crucial to the type of bag housings your industry will require, below are the flow capacities of both our single bag and multi-bag filter housings. These housings are equipped to handle a flow of up to 250 GPM. Our multi-bag filter housings are available in four, five, eight, and 12 bag housing options. Each bag unit can handle a flow up to 250 GPM and handle a flow rate of up to 6,000 GPM. If your industry requires a higher GPM, connect with us and discuss a custom multi-bag housing unit. What sets us apart is our ability to offer our clients stainless steel bag filter housings at carbon steel prices. One of the biggest benefits is your return on investment (ROI). 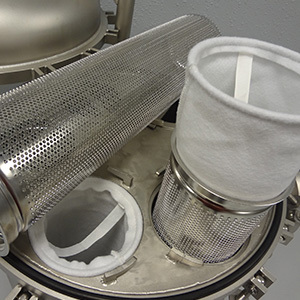 Our stainless bag filter housings also offer premier corrosion-resistance and durability over carbon steel. Stainless steel has the ability to form a chromium oxide layer to reduce corrosion, thus extending the life of your filters — saving you money on repairs and having to invest in another unit. It’s important to get a clear and concise picture of our bag filtration housings to better make the right choice for your company. We’ve examined our bag filtration systems and still have more to cover! Stay tuned for part three where we dive into the features and benefits of the products we offer at Filter Sciences. To learn more about our bag filter housings, reach out today!